Take an extraordinarily close-up look at nature through the Nikon&apos;s Small World 2016 Photomicrography Competition&apos;s 20 winning photographs, currently on exhibit at the Delaware Museum of Natural History as part of a national tour. The photographs&apos; microscopic perspective displays scientific images-including a butterfly&apos;s proboscis and actual human brain cells-in an artistic way. 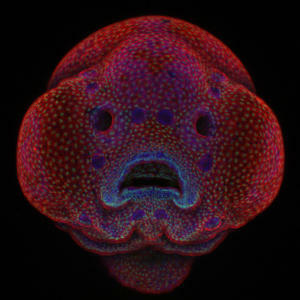 The winning photograph is of a four-day old zebrafish embryo, taken by Oscar Ruiz, Ph.D., a research scientist at the University of Texas MD Anderson Cancer Center. Dr. Ruiz studies zebrafish to see the effects of genetic mutations that lead to facial abnormalities. 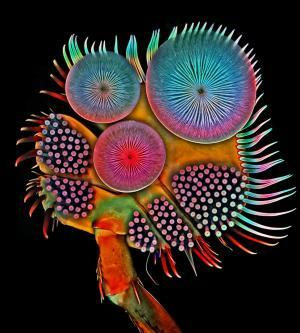 There were more than 2,000 entries by scientists, photographers and hobbyists. The full winner gallery can be viewed on www.nikonsmallworld.com. Information about entering this year&apos;s contest is also available. TIME: Monday - Saturday 9:30 a.m. - 4:30 p.m.; Sunday Noon - 4:30 p.m. ADMISSION: $9 for ages 3-59, $8 for seniors ages 60 and up, $3 for toddlers ages 1-2, free for babies younger than 12 months. Free admission for Delaware Museum of Natural History members. This is the 42nd year for the Nikon&apos;s Small World Photomicrography Competition, open to anyone with an interest in photography. Participants may submit their images in traditional 35mm format, or upload digital images directly at www.nikonsmallworld.com. For additional information, contact Nikon Small World, Nikon Instruments Inc., 1300 Walt Whitman Road, Melville, NY 11747, USA or phone (631) 547-8569. Nikon Instruments, Inc. is a world leader in the development and manufacture of optical and digital imaging technology for biomedical applications. Now in its 99th year, Nikon provides complete optical systems that offer optimal versatility, performance and productivity. Cutting-edge instruments include microscopes, precision measuring equipment, digital imaging products and software. Nikon Instruments is the microscopy and instrumentation arm of Nikon Inc., the world leader in digital imaging, precision optics and photo imaging technology. For more information, visit www.nikoninstruments.com. Product-related inquiries may be directed to Nikon Instruments at 800-52-NIKON. The Delaware Museum of Natural History opened its doors in 1972 to excite and inform people about the natural world through exploration and discovery. The Museum houses Delaware&apos;s only permanent dinosaur display, surrounded by exhibits of mammals, shells, and other specimens from around the world. The museum cares for world-renowned scientific collections of mollusks and birds, including one of the top-fifteen mollusk collections in the United States. For more information about the Delaware Museum of Natural History, visit our webpage at delmnh.org, or follow us on Facebook or Twitter. Images (top to bottom): 4th Place, Jochen Schroeder, Butterfly proboscis, Chiang Mai, Thailand Image Stacking, 6.3x; 5th Place, Dr. Igor Siwanowicz, Front foot (tarsus) of a male diving beetle, Howard Hughes Medical Institute (HHMI), Janelia Research Campus, Ashburn, Virginia, USA Confocal, 100x; 1st Place, Dr. Oscar Ruiz, Four-day-old zebrafish embryo, The University of Texas MD Anderson Cancer Center, Houston, Texas, USA, Confocal, 10x.